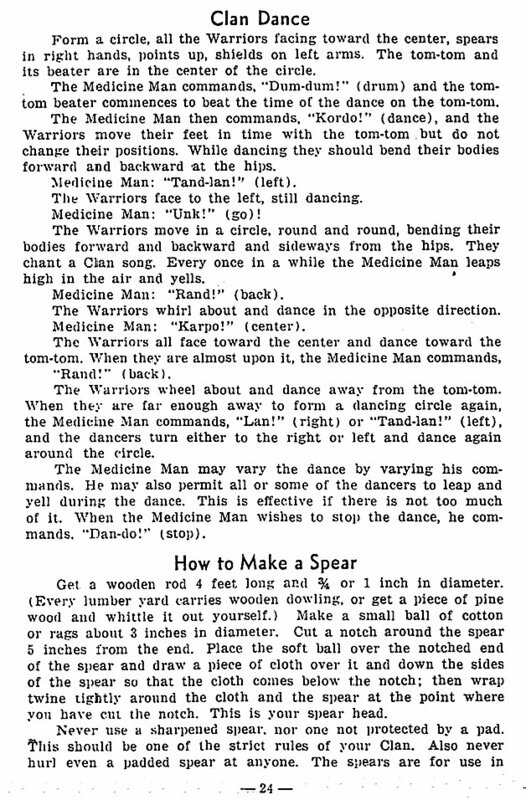 CLAN DANCE -- Involved the warriors armed with spears and shields chanting and dancing in a circle around a tom-tom beater. 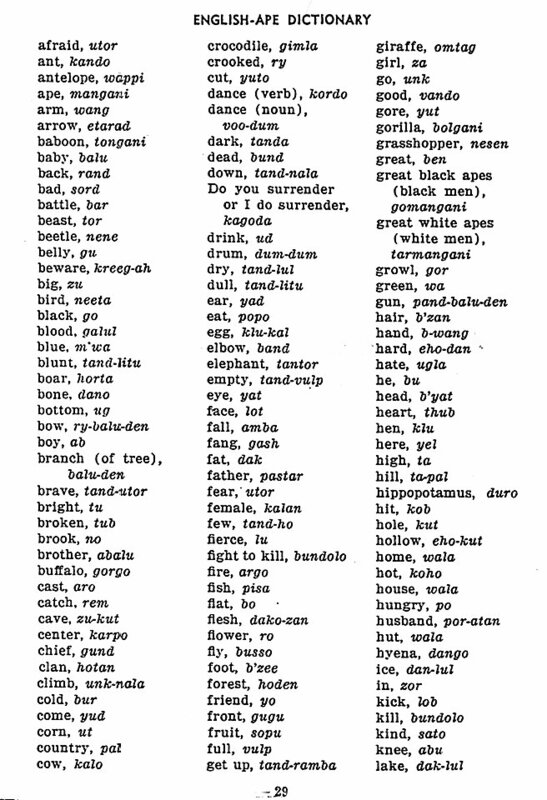 The Medicine Man gave commands such as "dum dum" (drum), "kordo" (dance), "tand-lan" (left), "unk" (go), "rand" (back), "karpo" (centre), "rand," "lan," "tand-lan," "leap," "yell," "dan-do," (stop). HOW TO MAKE A SPEAR - Take a 4 feet, 3/4 or 1" in diameter wooden dowel rod. To create a spearhead, cut a notch 5 inches from the end, place a ball of cotton rags at the end, draw a piece of cloth over it and down the sides, then wrap twine around the cloth and tighten it over the notch. Cut another notch below the first one to enable you to tie on bird feathers. Colored bands may also be painted on as decoration. 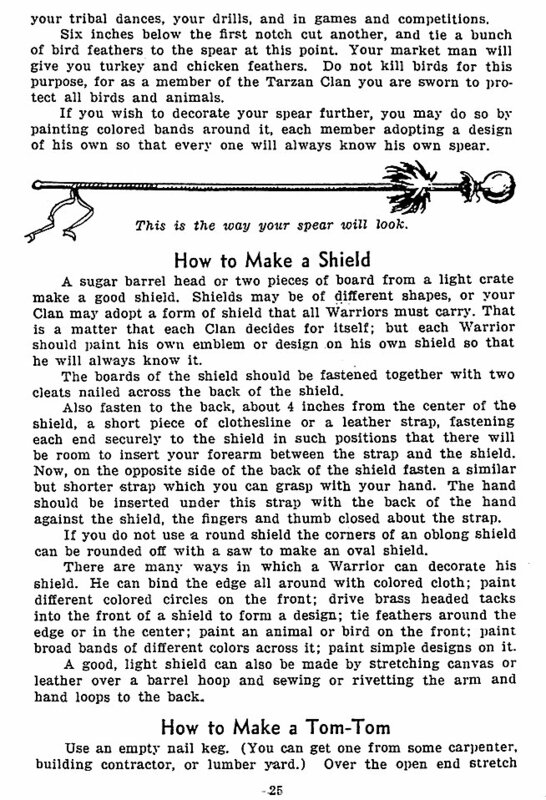 HOW TO MAKE A SHIELD - Use a sugar barrel head or two pieces of board from a light crate. Each Warrior should paint the Clan emblem as well as his own emblem or design on his own shield. Fasten short pieces of clothesline or a leather strap onto the back as hand and arm holds. A good, light shield can also be made by stretching canvas or leather over a barrel hoop and sewing or riveting the arm and hand loops to the back. HOW TO MAKE A TOM-TOM -- Stretch a piece of damp thin soft hide over an empty nail keg. Fasten it all the way around using large carpet tacks. Wrap heavy twine tightly around the keg on top of the ends of the hide. Decorate by painting on the Clan emblem and other designs. Attach bits of colored cloth, feathers, beads,and rings. 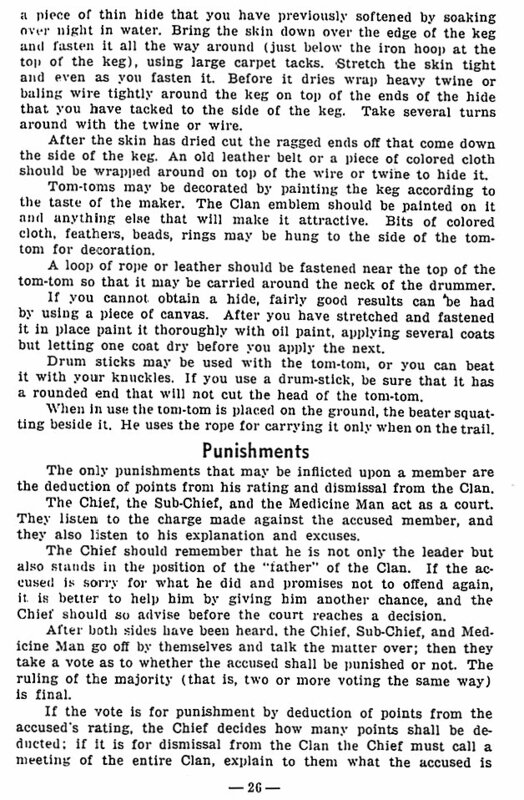 Fasten a loop of rope or leather so that it may be carried around the neck of the drummer. 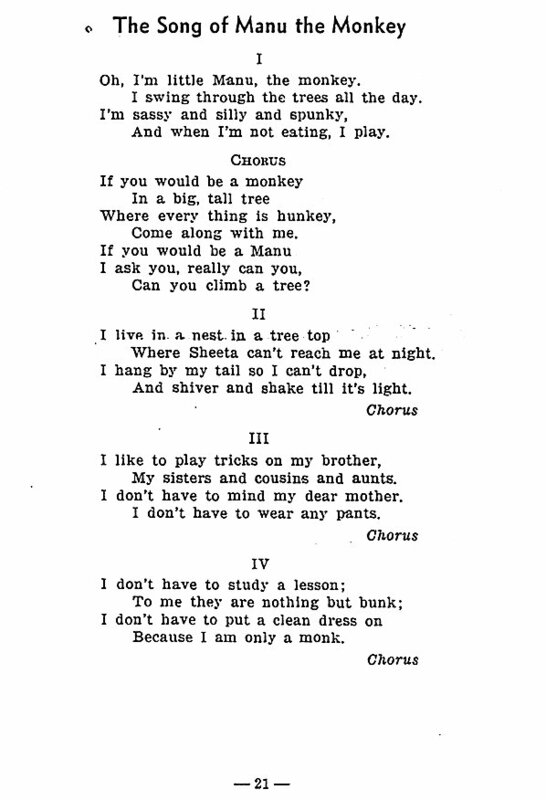 The drum may be beaten with drum sticks or knuckles. 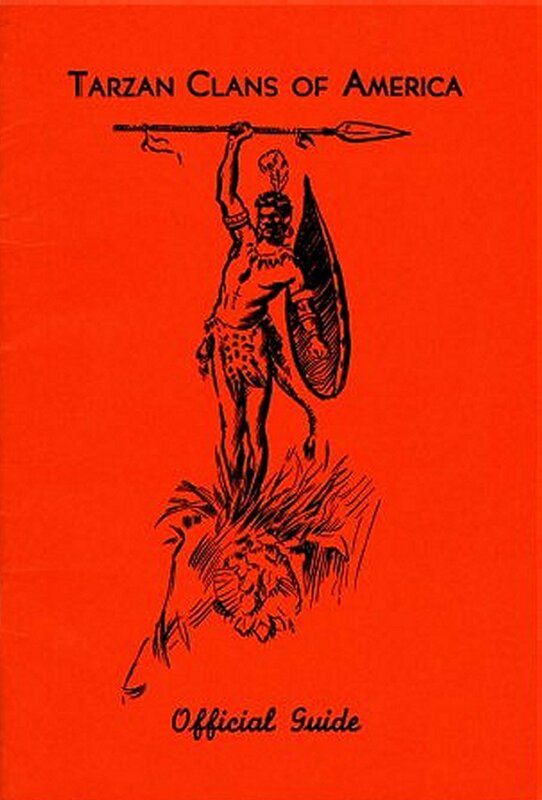 PUNISHMENTS - involved the deduction of points from the member's ratings or dismissal from the Clan. 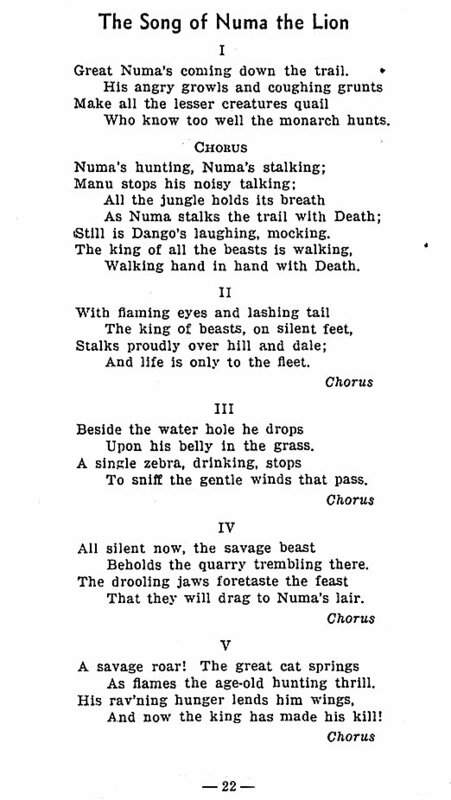 The Chief, the Sub-Chief, and the Medicine Man acted as a court and then they took a vote as to whether the accused should be punished or not. 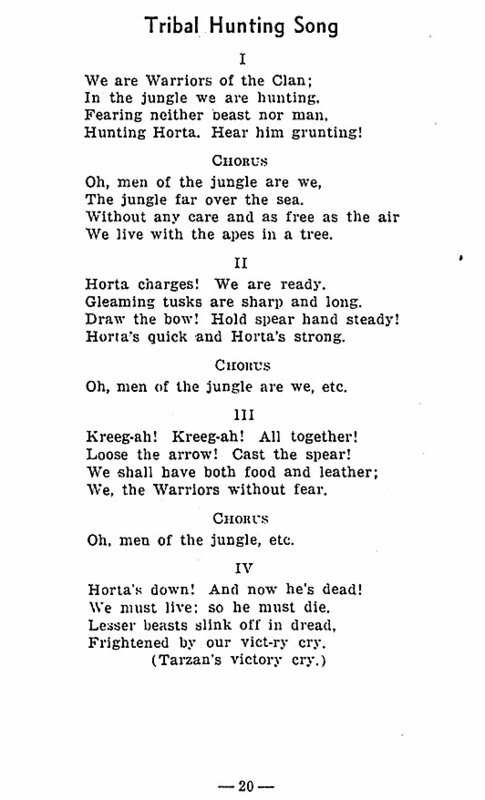 HOW THE CLAN VOTED ON THE DISMISSAL OF A MEMBER -- The Warriors, with spears and shields, encircled the Chief, Sub-Chief, Medicine Man and the accused. The Chief stated the charge and gave the accused a chance to speak in his defense. 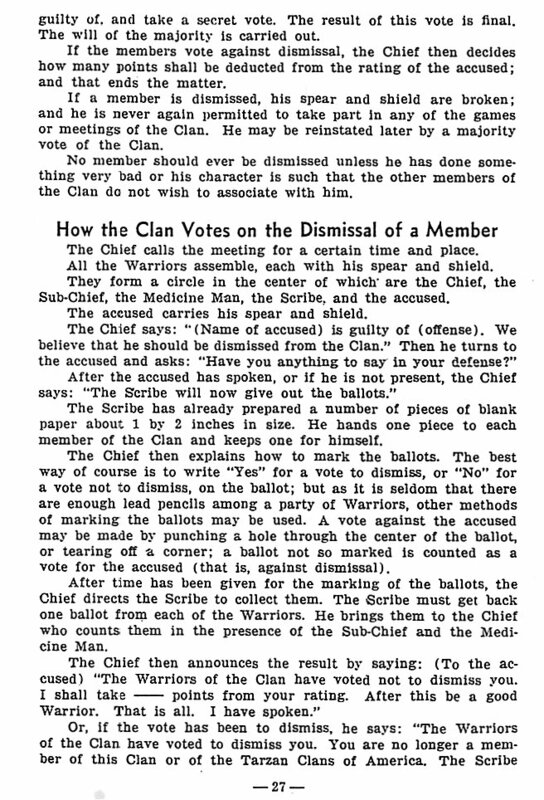 The Scribe then gave out the ballots and the members voted. The Chief counted the ballots and announced the decision. 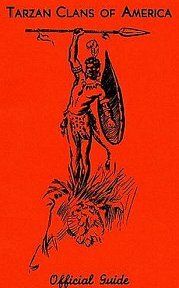 If the member was to be dismissed, the Chief took and broke his spear and shield. 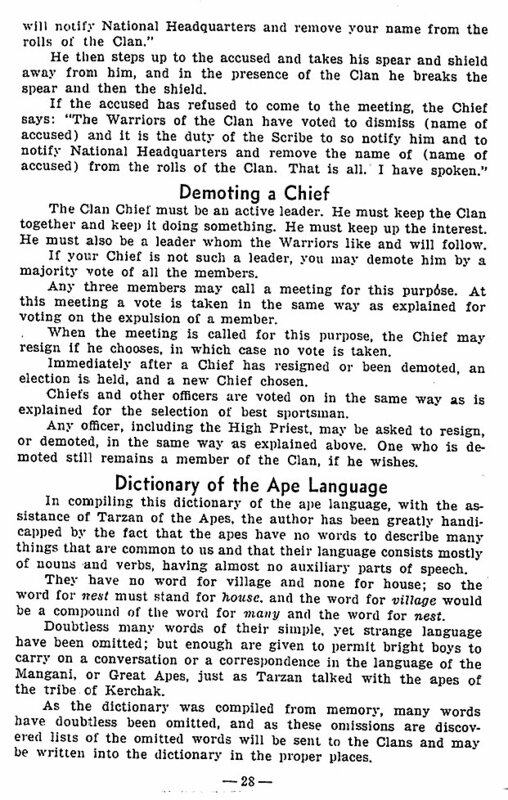 DEMOTING A CHIEF -- If the Chief was not a good leader he could be demoted by a majority vote of all the members and a new chief elected. 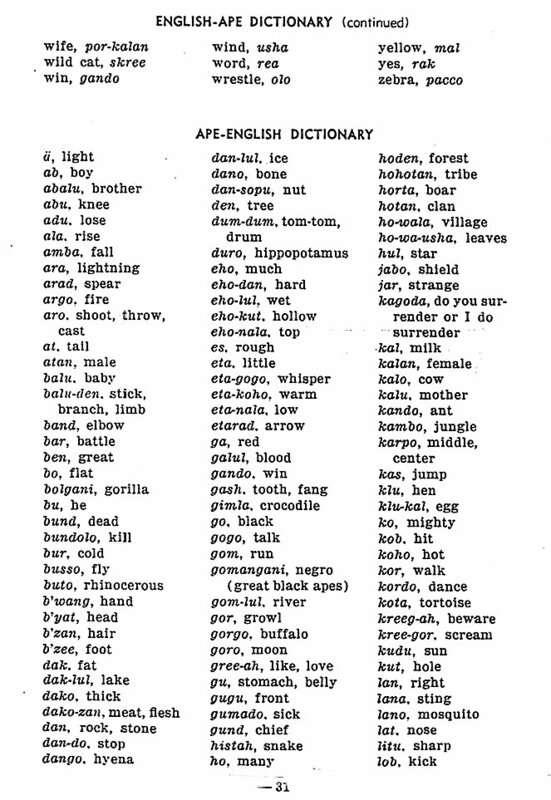 DICTIONARY OF THE APE LANGUAGE -- Despite having the help of Tarzan, the author (ERB) professed difficulties in compiling this dictionary. 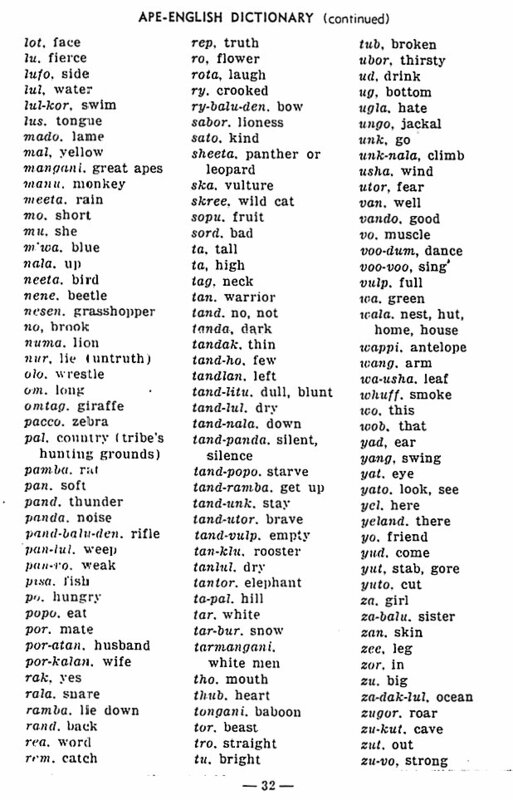 He pointed out that the apes had no words to describe many things that are common to us and that their language consisted mostly of nouns and verbs, having almost no auxiliary parts of speech. 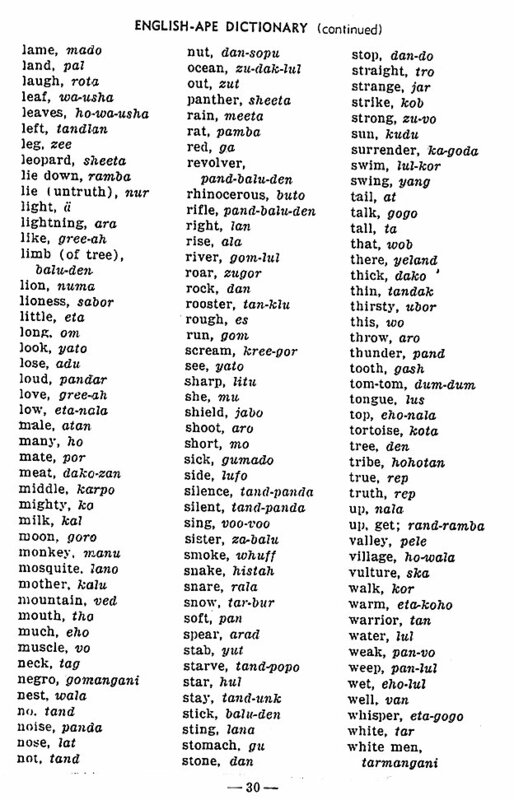 He admitted that many words of their simple, yet strange language were omitted; but enough were given to permit members to carry on a conversation or a correspondence in the language of the Mangani. Memberships were sent out and Clans were formed but, unfortunately, ERB's Tarzan Clans project withered on the vine for lack of support. 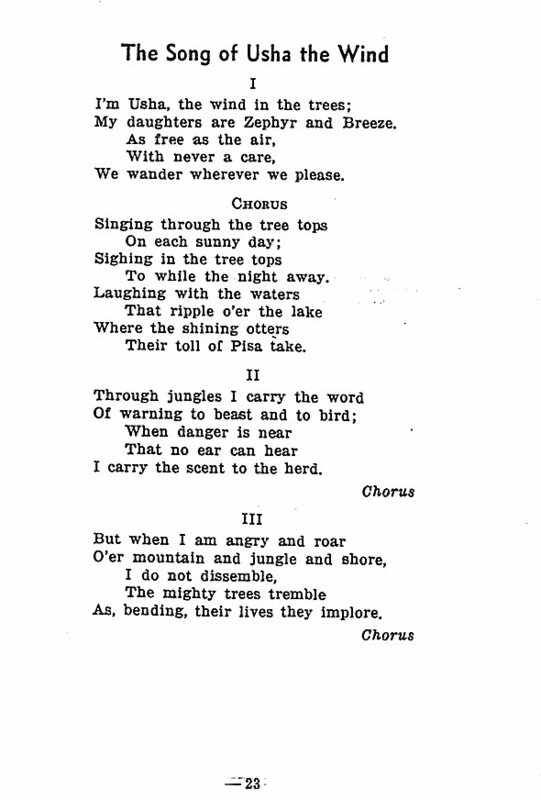 The chief contributing factor to its demise was probably the outbreak of World War II.